Died on March 22, 2019. Born in Brooklyn, NY, on December 2, 1938, he spent his formative years there, a passionate fan of Jackie Robinson, Duke Snider and the other Dodger greats of that era. Precocious, whip-smart, and the darling only child of his parents, Irene and Irving, he never afterward lost his accent or his working-class Flatbush-born drive to make something of himself in the world. On graduating from Walt Whitman Junior High, he moved with his parents to Washington, DC, where he attended Anacostia High School before going on to George Washington University and Georgetown Medical School . After graduating from Georgetown in 1963, he specialized in pediatrics, and served for the next few years as a commissioned officer in the Public Health Service, attached to the US Coast Guard, which had the wisdom, he always joked, to station him in the landlocked state of Arizona, where he was posted to the Phoenix Indian Hospital. 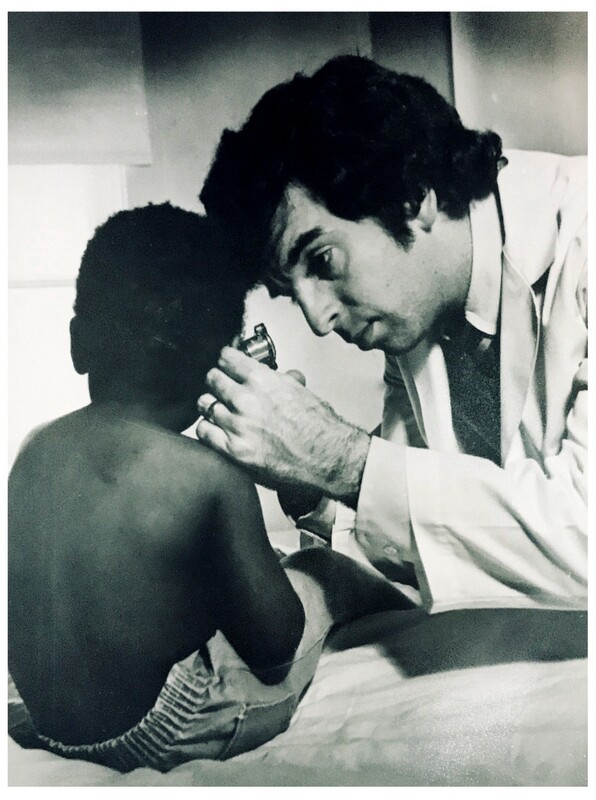 His long career as a doctor was marked by two overriding preoccupations: with the health and welfare of children, particularly the most vulnerable; and with reforming and improving the way healthcare is provided in the US. He was an early advocate on behalf of abused children as that issue entered the public discourse in the 1970s, founding a groundbreaking program for their care at Mt. Washington Children’s Hospital in Baltimore; and after taking a law degree at the University of Maryland in 1976, he became a highly sought-after consultant and expert witness for the plaintiffs in hundreds of cases involving pediatric malpractice. Coming of age as a doctor at the inception of Medicare, he was an ardent proponent of what he never stopped referring to, proudly, as “socialized medicine.” One of his greatest regrets, apart from not outlasting the current Presidential administration, was knowing he would die before “Medicare for all” became a reality. In 1969, his interest in alternative methods of healthcare delivery led him to move with his family — first wife Sharon and their two sons, Michael and Stephen — to the “New City” of Columbia, Maryland, where the Connecticut General Life Insurance Company was pioneering a brand-new model for providing care — the HMO. After moving on from the Columbia Medical Plan, he became Associate and then Assistant Chief of Pediatrics at Sinai Hospital in Baltimore before taking over the operation of a failing, private children’s hospital there, then known as Happy Hills, reinventing it as Mt. Washington, with a mission to serve Baltimore’s underserved population of sick and battered children. It was at Mt. Washington in the mid-seventies that he met his beloved second wife, of forty-two years, Shelly, then employed as the hospital’s pediatric speech pathologist and audiologist. The years of their marriage took them from Baltimore to Pittsburgh, where he served as Chief of Pediatrics at Mercy Hospital and professor of law at Duquesne University; added a third advanced degree, a Master’s in Public Health from the University of Pittsburgh, to his formidable arsenal of professional qualifications; and welcomed two more sons, Andrew and Daniel, into his life. Always seeking new professional challenges — his avowed speciality, as a chief medical officer for hospitals and eventually entire hospital systems, was “bringing order to chaos” — his restlessness carried him over the next quarter-century from Pittsburgh to Atlanta, Northern Virginia, Kansas City and Portland, Oregon, where even in “retirement” he consulted on hundreds of malpractice cases for the Jack Olender and Johnnie Cochran law firms, and where he died, early Friday morning, after struggling for nearly two years with the failure of his kidneys, heart and liver. He is survived by Shelly, all four of his sons, and seven loving grandchildren. Sometime around the age of fifteen, Bob Chabon determined that his life’s aspiration was to be a Renaissance man, an ambition that he proceeded over the next sixty-five years, methodically and joyfully, to fulfill. A devotee of classical music, baseball and literature, he also took a lively and indiscriminate interest in a wide range of subjects, from history to philosophy and ethics, from The Simpsons to economics to linguistics, from classic Toho Studios monster movies to theoretical physics to US politics. A ranked chess player, an avid collector of stamps and pop memorabilia, and a vivid raconteur who was unafraid to enliven his stories with a little helpful color from his ready imagination, Bob was prepared to offer an informed opinion on a dizzying variety of topics, from the prospects of a college draft pick to the chances for impeachment to the best local place for egg rolls or bagels and lox. He was always reading at least three books at a. time, often more, and he kept up religiously with his chosen roster of periodicals and websites, among them The New Yorker, Foreign Affairs, Baseball Prospectus and the New York Review of Books. All those who knew, loved and respected Bob Chabon would agree that his considerable gifts were put to their finest use when someone was in trouble and needed the assistance — always freely and generously given — of an unusual, unusually brilliant, able and resourceful man who was a doctor, and a lawyer, and a person of rare experience and keen judgment. By the end of his life such people were numerous and widespread and always felt themselves the better, as their loyalty and affection to him never failed to show, for having known him.